Broaching is a machining process for removal of a layer of material of desired width and depth usually in one stroke by a slender rod or bar type cutter having a series of cutting edges with gradually increased protrusion as indicated in Figure. 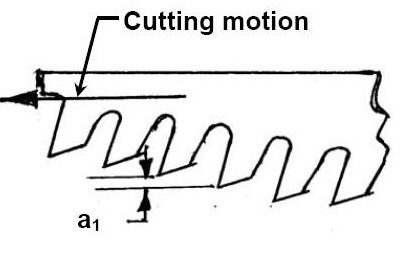 The difference in broaching and shaping, is that broaching enables remove the whole material in one stroke only by the gradually rising teeth of the cutter called broach where as shaping requires a number of strokes to remove the material in thin layers step by step by gradually infeeding the single point tool. Machining by broaching is preferably used for making straight through holes of various forms and sizes of section, internal and external through straight or helical slots or grooves, external surfaces of different shapes, teeth of external and internal splines and small spur gears etc. Both pull and push type broaches are made in the form of slender rods or bars of varying section having along its length one or more rows of cutting teeth with increasing height (and width occasionally). Push type broaches are subjected to compressive load and hence are made shorter in length to avoid buckling. Pull end for engaging the broach in the machine. Neck of shorter diameter and length, where the broach is allowed to fail, if at all, under overloading. Front pilot for initial locating the broach in the hole. Roughing and finishing teeth for metal removal. Rear pilot and follower rest or retriever. 1. It is the fastest way of finishing an operation with a single stroke. 2. Very little skill is required from the operator. 3. It is simple since only a single reciprocating motion is required for cutting. 4. Final cost of the machining is one of the lowest for mass production. 5. Any type of surface, internal or external can be generated with broaching. 6. Good surface finish and fine dimensional tolerance can be achieved. 1. Custom made broaches are very expensive and hence generally used for very large volume production. 2. The lead time for manufacturing is more for custom designed broaches. 3. A broach can be designed and used for a specific application. 4. As it is a very heavy metal removal operation, it requires that work-piece is rigid and capable of withstanding the large forces.